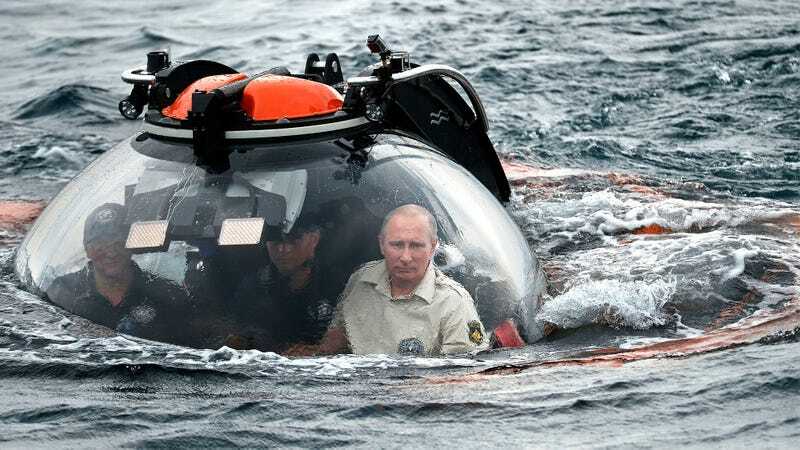 During his visit to the Crimean peninsula, which he annexed last spring, Putin boarded a tiny submersible and plunged into the abyss. While roving 272 feet down on the seafloor, the Russian President was said to be in radio contact with Prime Minister Dmitry Medvedev, to whom he communicated his intent to illustrate “how deep our historical roots are.” Evidently, he needed to personally see the shipwreck to make this point. This isn’t Putin’s first sub-surface excursion, having explored a 19th century shipwreck in the Gulf of Finland in 2013 as well as Lake Baikal (the world’s deepest freshwater lake) in 2009. As the world knows, he’s never been one to shy away from action-oriented photo opportunities, having flown in a microlight aircraft, taken a back seat ride in an Su-27 fighter, piloted a Be-200 firefighting amphibious jet, driven a Formula 1 car, and even shot a tiger with a tranquilizer gun. Lest we forget there was also that time he went horseback riding sans shirt, for some reason. With fighting in Ukraine continuing to rage month after month and the Russian economy reeling from sanctions and devaluation of the ruble, it is difficult to make sense of Putin’s priorities. In his attempt to link Russia’s history with the Byzantine shipwreck, he may have inadvertently portrayed himself as completely disconnected from more pressing issues. Then again, doing so could have been his plan all along (touches pinkie to mouth plus diabolical laugh).